Contrary to popular belief, although there’s many similarities, chrome door handles aren’t stainless steel, and stainless steel handles aren’t chrome! Whilst the two may look very similar there is a difference between them, albeit taking a trained eye to determine using sight alone. Whereas stainless steel door handles are manufactured from a steel alloy containing a varying percentage of chromium depending on the grade, chrome door handles can be manufactured from various base metals which are chrome plated after to provide either a polished mirror like, brushed or mixture of both finishes on the surface. Since the mid 90’s when contemporary interior design started to become popular, product designers quickly followed the trend, which lead to manufactures producing stainless steel and chrome door furniture, soon becoming the preferred choice for architects and property developers, except perhaps when upgrading door furniture within traditionally decorated or period properties where antique polished brass or black door handles are more suited and complementing. Similar to how front doors can ‘say a lot’ about the person who lives behind, the door handles throughout your home also add personality, and certainly get noticed by all of those who visit. So regardless of whether you choose stainless steel or chrome interior door handles, as long as your happy with the style and price then both will transform your doors creating a contemporary look once fitted. As with everything though, there are advantages of both materials and methods of manufacturing. 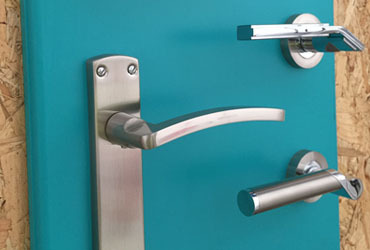 The benefit of chrome door handles over stainless steel is that because of the choice of base metal the manufacturer has, it means the levers or knobs can be formed easier leaving virtually no limitation with design, providing a wide variety of styles and shapes with even the most intricate detail. Another plus point is that the cost of manufacturing chrome door handles can be lower, which means the customer gets great looking contemporary handles for less. The advantage of stainless steel door handles is that there are numerous grades, and the higher the grade stainless steel used in manufacture the more resistant the handles become to atmospheric conditions. This isn’t usually a concern when fitting interior door handles, where grade 304 is most commonly used, but if they are for outside use, in coastal properties, swimming pools or marine projects then a grade 316 is typically recommended due to its increased resistance to corrosion. Another benefit that stainless steel door handles have over chrome handles is that some models are fire rated, meaning they have been tested and can withstand a duration of time under standard fire conditions, which is important for property developers where building regulations may require that fire rated door handles are used. Whether you buy chrome door handles or decide upon stainless steel then from time to time you will need to clean and buff them. This should be done by wiping the surface of the handles with a soft cloth using nothing more than mild soapy water, before wiping again with clean water and drying with a soft towel. It is important that you never use cleaning products that contain chlorine or other abrasive chemicals nor should you use scouring pads as this can damage the finish. Read our articles, cleaning stainless steel door handles and 8 tips for cleaning interior doors for more on cleaning door furniture.